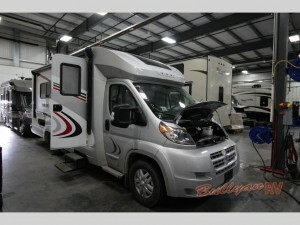 If you’ve been waiting for that deal of a lifetime, then you will absolutely want to jump on board with the absolutely ridiculous closeout price that we have on the Winnebago Trend 23D class C motorhome for sale right here at Bullyan RV. A true feat of engineering, this 2017 model is priced to sell quickly. With over $25,000 in savings on this closeout, we are certain that the Trend will not last long on the lot, so if you are interested, make sure that you come by today to take advantage. If you want to know more about why the Trend is an amazing class C and what makes this such a great deal, we have put together a list of our favorite features for you to consider. From stow-away stoves that allow you to take full advantage of the counter to storage space in every convenient area, the Trend 23D makes it easy for you to bring everything that you need and still have more than enough room to move around and do what you need to do to keep things clean and comfortable. The Winnebago Trend Class C Living Room and Kitchen areas. With sleeping capacity for three, the Trend is the perfect couples camper or camper for those with a child who loves the great outdoors. With a sleeping area with a television that converts into a seating area, you will be able to keep entertained and comfortable no matter where the road leads. Check out the Winnebago Trend Class C Interior. Full standing shower, toilet, and sink, all placed in a pleasing, space conscious, but also, uncramped area, the bathroom in the Trend is easy to clean and very enjoyable to relax in at any point of your trip. Plus, with the additional storage space, you will be able to bring all of your best linens on the road for an added touch of home. These may be some of our favorite features, but there are a ton of other ones to love when you purchase one of the Winnebago Trend floorplans. But remember, this model will not last on our lot for very long, so do not hesitate to come by and check it out for yourself. You will be very happy that you did! If you have any other questions, you can also contact us for all of the details.